Over the past little while I have been using NixOS as my daily driver Linux system. Nix takes a fairly unique approach to package management and configuration and is built using its own functional programming language. If you are interested in NixOS and want to know how it works @Dje4321 has a good write up as part of her Linux one year challenge that explains it in much more detail. This guide goes into how to setup PCIe passthrough of a physical GPU to a virtual machine using NixOS and its functional programming language to configure the system and assumes you have a basic knowledge of NixOS and how to configure the system, if you are unsure please refer to the Nix manual on how to configure the system and of Libvirt/QEMU and how to setup a virtual machine. Before starting ensure that virtualization and either AMD-VI/Intel VT-d is supported by your CPU and that they are enabled in your BIOS. 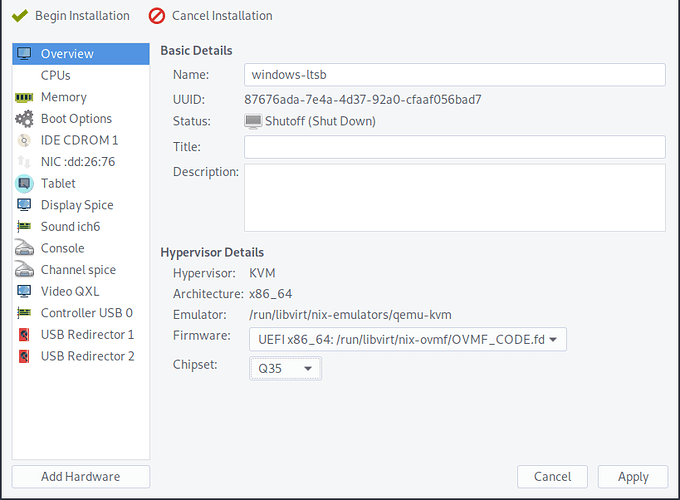 We are looking to see if the graphics cards are in their own separate isolated IOMMU groups so we can freely pass the card to the virtual machine. Take note of the device ids of the card you are passing through e.g. 10de:13c0 and 10de:0fbb as we’ll need them later. Note: that the VGA and Audio device on the same card can share a group. the important thing to remember is all devices in an IOMMU group must be passed to the virtual machine. With all the needed configuration setup rebuild NixOS and reboot the system. 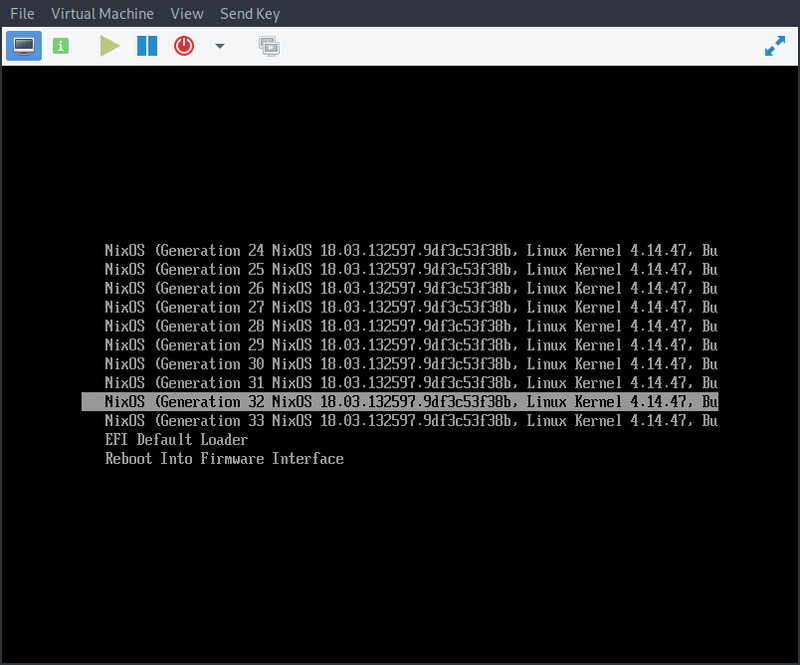 If the changes you made to the configuration somehow broke your system or failed to load any graphics drivers with no video out don’t worry, NixOS keeps a record of your configurations (or Generations) and you can boot into your previously configured systems from the boot menu to get back into a working system. You can also install virt-manager by either adding it to your packages list in the configuration or to your local user with nix-env -i virt-manager which we will use to configure the virtual machines. 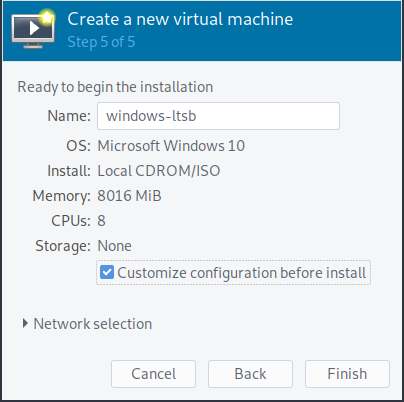 Using virt manager go through the wizard to setup a virtual machine and on step 5 check Customize configuration before install as we need to change some things to make our virtual machine bootable. From here we want to change the firmware from BIOS to using the OVMF firmware and the chipset from the older i440FX to Q35 which will give us fully PCIe support. Now we can finally add the graphics card to the virtual machine. 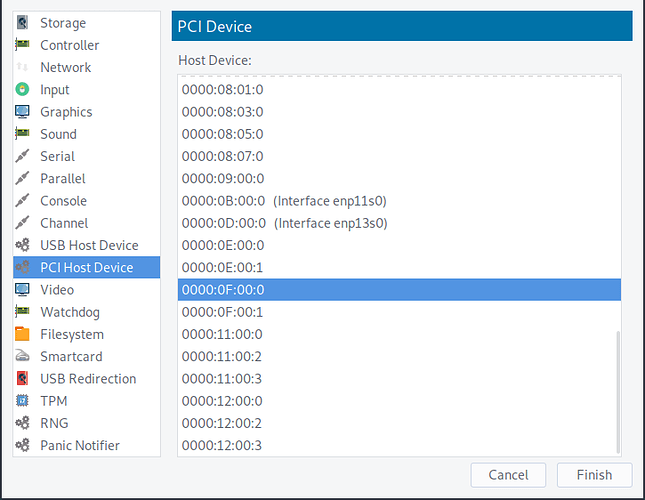 Go to Add Hardware > PCI Host Device and select host device for both the vga and audio adapter for your card. There are potential risk in doing this next step and you should read into ACS patching if you decide to do it. The Arch wiki has a good resource on it here. If you have more PCIe devices you want to pass through but your iommu rules are not favourable we can patch the NixOS kernel to include the ACS patch which will loosen up the groups and allow us to pass through more devices. Note: When rebuilding the configuration to compile the new kernel it is recommended to run the rebuild command with the optional --cores flag set to the number of threads on your CPU, otherwise it will compile with a single core such as nixos-rebuild boot --cores 16.